My Supps Maxximum Mass Gainer can help gain weight and build muscles. My Supps Maxximum Mass Gainer with protein, carbohydrate and creatine. ≙ 24,99 € ✔ Delivery time 1-3 working days within Germany. Content is sufficient for use according to our recommendation for 45 day(s). My Supps Maxximum Mass Gainer is a high-energy dietary supplement designed specifically for athletes wishing to gain weight. In addition, though, non-athletes and underweight people can naturally use My Supps Maxximum Mass Gainer to gain weight at a faster rate. In order to gain weight, the body must take in more energy than it burns. Dietary supplements such as My Supps Maxximum Mass Gainer can help if this is not possible by means of normal nutrition or if the daily energy requirements are very high due to intense physical exertion. Additionally, regular training and protein-rich nutrition are necessary if you want to build muscle mass especially and not just gain weight. After all, protein contributes to building and preserving muscle cells. Worth knowing: What else acts in My Supps Maxximum Mass Gainer? The product contains glucose and other carbohydrates, available to the body quickly. Further, it has an over 15 % content of high-value proteins made of soy, whey and milk. 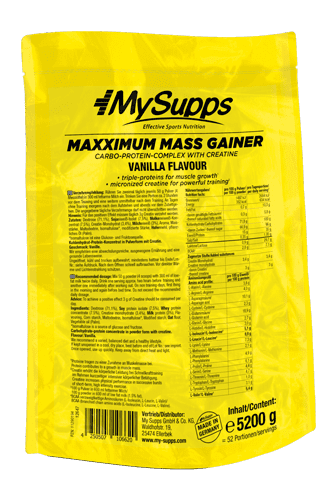 MySupps Maxximum Mass Gainer contains almost no fat (under 1 percent); after all, the desire to increase weight does not necessarily means that you have to put on fat. Creatine was also added to Mass Gainer. Worth knowing: What is creatine? Creatine is an organic acid. In the human body, the acid is synthesised in the liver, the pancreas and the kidneys on the basis of three amino acids: Glycine, Methionine and Arginine. 90 percent of creatine is stored in the skeletal muscles. Creatine enhances physical performance in explosive strength training involving short, intense physical exertion - making it interesting to bodybuilders and strength athletes above all. But other athletes, for instance weight lifters, marathon runners and sprinters, can also benefit from taking creatine. Creatine is an endogenous substance in all vertebrates and is hence contained in foods such as meat and fish. 100 grams of My Supps Maxximum Mass Gainer contain 3 grams of creatine. This is the daily dosage required to produce the performance-enhancing effects that creatine can have on the body. Which products can My Supps Maxximum Mass Gainer be combined best with? ?